A reputed Korean analyst issued a note to clients that opined on the recent Samsung stock slump that started when JP Morgan and others lowered their sales expectations for the Galaxy S4. In-between the comparisons with the Galaxy S3 sales and the redced forecast for the S4, as well as the tidbits on the competition, he let out that the Galaxy Note 3 is indeed coming in September, which leads us to believe once again that Samsung will be unveiling the third generation of its stylus-equipped phablet line at the IFA expo in Berlin, which spans September 6-13th. The only Samsung device that I adore. You adore something that is still under speculation. 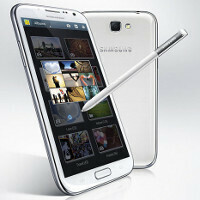 Considering the Note II is a blown up look alike of SIII, i won't be suprised to see the third Note looking like S4. Although, i think that's not going to be Samsung's route this time. You will run away after seeing the beast...!! I hate S2, S3, S4. Nothing revolutionary. I love Note series for its big screen, Stylus and Gestures. G Pro is good too but Stylus on Note 2 takes the lead. How different is that from the MILLIONS each year that adore the much speculated and undeservedly much anticipated next iPhone? Jealous much?? Don't have a stylus and don't know what to do with yourself??? Tired of carrying around binoculars just to read your email???? Tired of updating iTunes every week?????! Yes!! This is what I'm waiting for... BRING IT ON!! idk if i'll be buying another samsung note, this one is kinda too big. Plus, not a huge touchwiz fan. Not to be a troll but I want a solid built phone, and the S line just is not that. Although, I will give Samsung credit for the S4 Active, the chances of that showing up on verizon in the next few months probably aren't very good. It will depend on how thin the bezel will be. A 6 inch screen with an ultra thin bezel sounds OK. This is unlikely to happen, but what if Note III comes with a dual core Snapdragon S4 pro, 720p with 1GB RAM? Will you still buy it? I'm just questioning your comment...nothing else.